Casaveen Knitwear is one of Australia's remaining knitting factories. It is in the heritage town of Oatlands , 60 minutes drive north of Hobart Here you will see a working knitting factory manufacturing world class knitwear in a wide range of stunning colours. You will hear the story of the McShane family and Casaveen Knitwear that started from a downturn in the wool industry to become the success it is today, The Casaveen complex encompasses a Showroom, licensed Caf�, Meeting Room and Visitor Centre. 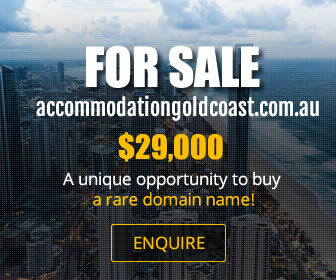 All facilities are excellent including accessible facilities, with ample off street parking. Why not sit in the courtyard and enjoy some legendary Tasmanian hospitality while learning about the local history or finding that special jumper that will become your favourite and most comfortable piece of clothing! Come & find out more about how garments are made, enjoy lunch or just coffee, the history of the area, the story of Casaveen and why they are so committed to remain manufacturing in Tasmania, Australia. 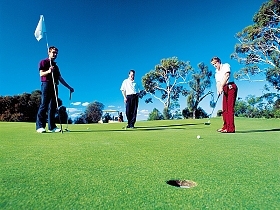 The Oatlands Golf Course is a public, nine-hole course in the Tasmanian Midlands. Oatlands is an hour's drive north of Hobart and 90 minutes south of Launceston on the Midlands Highway. The Oatlands Golf Club features fully watered greens, tees and fairways. This is an attractively laid-out course, which draws abundant bird life. The Club welcomes new members and green fee guests and regular competitions including a weekend mixed competition and Wednesday afternoon chicken run. The Oatlands Golf Club was also the location for the inaugural B Grade Amateur Championship of Tasmania in 2006. Holes: 9, Par: 70, Length: 5,414 metres, Australian Course Rating: 67. Experience the Callington Mill at Oatlands, Australia's only fully operational colonial windmill. Built in 1837, the Callington Mill offers visitors a fascinating insight into our enterprising colonial past, producing locally grown flour as it was ground in the colonial period. 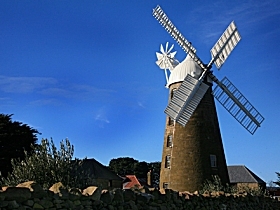 Set within the beautiful village of Oatlands, which boasts the largest intact Georgian streetscape in Australia, the Callington Mill, with its sails gently turning in the breeze, provides the unrivalled experience of seeing the mill working first hand in an authentic heritage environment. Oatlands is alive with convict, military and settlement history, and offers visitors a range of professionally guided and self-guided tour options, including: The Millers Way - includes a tour of the Mill tower. The Executioners Walk - a tour of the Oatlands Military Precinct. Oatlands Town Tour - unlocking the stories behind the sandstone. Heritage buildings have been reinvented as cafes, antique shops and galleries, showcasing unique Tasmanian craft, including pottery, knitwear, children's clothing, jewellery, paintings, fabric and baked goods created by skilled artisans. Oatlands also offers great accommodation choices from grand Georgian B & B's through to gorgeous self contained cottages. 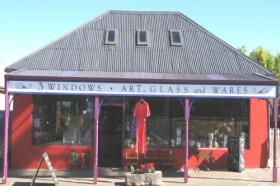 3 Windows Gallery are an art gallery located in Oatlands, in Tasmania's South. 3 Windows Gallery has an eclectic array of contemporary art, craft and gifts from the locally created, to boutique items from across Australia and far exotic lands. 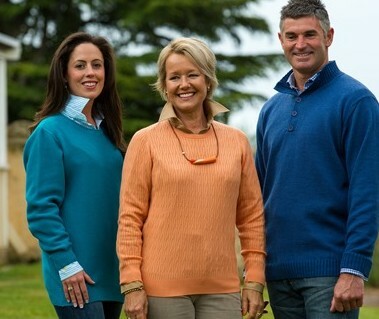 A fantastic range of quality clothing, Tasmanian made Smitten Merino wear and Italian designer knitwear. Art Glass is made on the premises. Also, not to be forgotten is the mezzanine filled to the brim with retro clothing and collectables. We are easy to find at the Northern end of High Street in Oatlands. Oatlands is a one hour and 10 minute drive (83 kilometres, 52 mile) North of Hobart. The Oatlands Court House is an historic Georgian building in Oatlands, in the Tasmanian Midlands. Oatlands is an hour's drive north of Hobart (79 kilometres/49 miles) and 90 minutes south of Launceston (115 kilometres/71 miles). 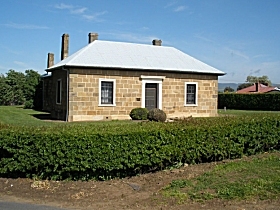 Built by convict labour in 1829, the Oatlands Court House is the oldest supreme court house in rural Australia and the oldest building in Oatlands. This fine example of a Georgian public building was originally constructed as a combined Chapel and Police Office. It was purchased by the National Trust in 1977. Oatlands has the largest collection of sandstone buildings in a village setting in Australia. The town's authentic colonial character is reflected in 87 original sandstone buildings along the town's main street. Some of the more significant buildings include the Oatlands gaol (1835), Commissariat's store and watch house (1830s) and officers' quarters (1830s). The Callington Mill (1837 is the third oldest windmill in Australia. The Oatlands Gaol House is heritage-listed building at Oatlands in the Tasmanian Midlands. 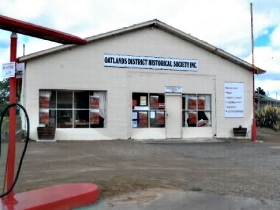 Oatlands is an hour's drive north of Hobart (84 kilometres/52 miles). Oatlands was established as a military garrison in 1827 and was the primary military outpost in inland Tasmania. 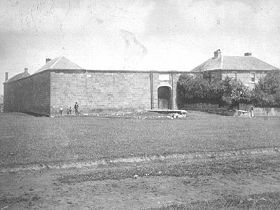 Over the next decade, close to 90 buildings were constructed in the town using convict labour, including the court house, soldiers' barracks, watch house, and officers' quarters. Today, the town has one of the largest collections of intact Georgian architecture in Australia. Completed in 1835, the Oatlands Gaol was designed to hold over 200 prisoners but was never fully occupied. Used as a military Gaol and municipal prison until 1936, the complex was closed and largely demolished in 1937. The Gaol's main use since the 1950s has been as the site of Oatlands' municipal swimming pool. You can still see the Gaol's crumbling sandstone walls and the intact Gaoler's residence, which is rumoured to be haunted. A conservation project is being planned for this historic site, beginning in 2007 with an initial restoration project for the Gaoler's residence.